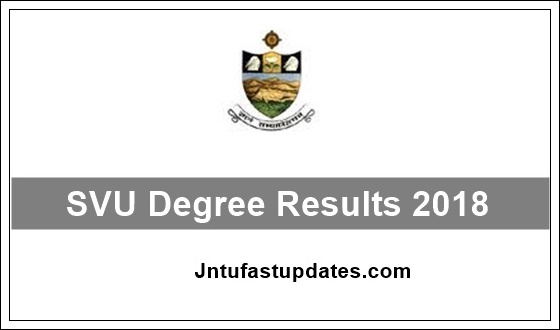 SVU Degree Results 2018-2019: Sri Venkateswara University Degree UG 1st, 3rd Sem results October/November 2018 for BA, B.Com, B.SC will be released at manabadi.com, svuniversity.ac.in. Students may check their SVU Degree 1st sem Result, SVU Degree 3rd sem Result below. SVU UG (CBCS) V Semester Exam Results Oct/Nov 2018 Released. Sri Venkateswara University had declared the Degree 2nd, 4th, 6th Semesters results at official website. Students can check SVU UG Degree II, IV, VI sem Results 2018 for BA / B.Com / B.Sc / B.SC (HSC) at results website manabadi.co.in. Students pursuing the same have appeared for the examinations which were conducted in the month of April/May, 2018. Students can check Sri Venkateswara University UG (BA/BCOM/BSC/BSC (HOME SCIENCE) exam results at official website svuniversity.ac.in. People are eagerly waiting to check their result, so scroll down below and check out process to check SVU Results 2018. So we can expect results in this june month at anytime. Above 1 Lakh candidates appeared exams on October/November 2018. Candidates may visit official web portal at manabadi.co.in and get your SVU Degree 1st, 3rd and 5th Semesters Results 2018. While downloading the results, login with Hall Ticket Number & DOB to check individual marks. STEP 18: If there is any problem in submitting your application form, Please do re click on apply. Make sure, to submit hard copy of revaluation application to Honorable CE’s office. How To Check SVU/ Sri Venkateswara Degree Results 2018-19? 1.3 How To Check SVU/ Sri Venkateswara Degree Results 2018-19? Hahahha ur daily saying the same ….